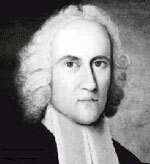 Jonathan Edwards, third president of Princeton for a brief period in 1758, was born in East Windsor, Connecticut, where his father was pastor. The only son in a family of eleven children, he entered Yale when he was not yet thirteen and graduated four years later at the head of his class. He studied theology, preached in a Presbyterian pulpit in New York, and in 1724 returned to Yale as tutor for two years, the second year as senior tutor and virtual head of the college, the rectorship then being vacant. Edwards was elected president of Princeton September 29, 1757, five days after the death of his son-in-law, Aaron Burr, Sr., second president of the College. He was a popular choice, for he had been a friend of the College since its inception and was the most eminent American philosopher-theologian of his time. But Edwards shrank from taking on "such a new and great business in the decline of life," feeling himself deficient in health, in temperament, and in some branches of learning. He finally yielded when a group of ministers persuaded him that it was his duty to accept. Late in January 1758, he came to Princeton, where he preached in the College chapel and gave out questions in divinity to the senior class for each to study and write "what he thought proper" before coming together to discuss them -- an eighteenth-century seminar. The seniors spoke enthusiastically of the "light and instruction which Edwards communicated."